Boldrocchi has been manufacturing coolers since 1931. We tailor-make each one to our customers’ specifications. We are also specialists at analyzing your process parameters to find you the optimal process or machine cooling solution. We design and manufacture all parts of a cooling system: heat exchanger, tubes (finned and regular), fans, circulating pump & electrical devices. 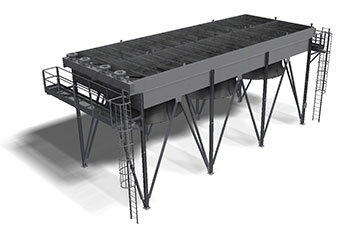 We can design and produce any size of cooling system, from small to immense. We accurately calculate which material should be chosen from a variety of options including alloy copper-nickel 90/10, titanium, and other special materials. The tradespeople at our Italian manufacturing facility are among the best, ensuring you top quality products. We have numerous references in this specialty, required to resist shock in certain applications. Our in-house facilities allow us to undertake thermal, mechanical, structural, stress and noise tests, guaranteeing peak performance and reliability.